Why do e-mail threads from this list not display as properly threaded messages in my e-mail client? * I'm on many lists and this is the only one with this behavior. I'm using Mail.app on OS X. 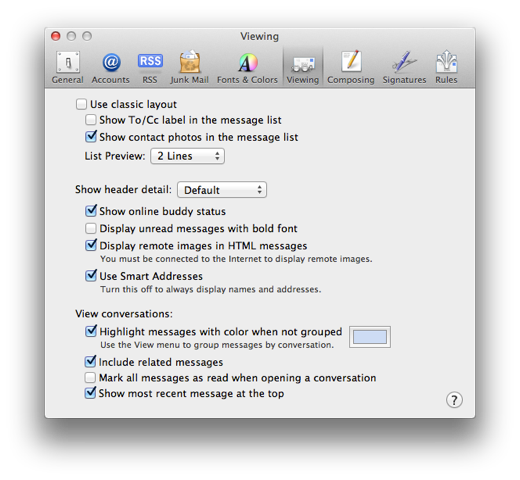 * Related messages all display as separate items instead of being displayed as one item with a disclosure rectangle. This makes reading and mass deletion harder than necessary. The majority display threaded for me. However, those from jwe and others often do not. I have no idea why. When I click on the list of e-mails in the Octave user's inbox, all other items in the list that should be threaded are instead highlighted in blue but not collected under a disclosure triangle. This is in Classic Layout. Also using 10.7.5. Odd. Using Classic makes no difference for me. I've attached my "Viewing" setting.